A reader recently asked whether he should have his shirt cuffs made bigger – or the sleeves shorter – in order to accommodate a watch. This is relevant to anyone buying a shirt, not just those commissioning bespoke. The short answer is no, if you can help it. Unlike the sleeve of a jacket, a shirt sleeve relies on gripping the wrist to keep it at the correct length. This enables it to have excess cloth in the sleeve so that when the arm is extended, this excess is taken up and the cuff remains on the wrist. If a shirt cuff is made too big, it risks slipping too far down the hand, or compromising this excess in the sleeve. Having a larger shirt cuff to fit over a watch is a poor functional solution in any case. The sleeve can often become stuck on the watch, or sit at odd angles. 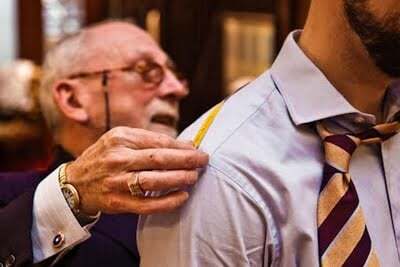 I learnt these lessons personally and painfully over several years of having shirts made at Turnbull & Asser. At my first appointment with the lovely David Gale I was wearing a big sports watch (horrible thing) and he compensated by making both cuffs bigger, therefore sitting lower on the hand. Suit sleeves were subsequently cut longer too, to leave the required half-inch of cuff. They were even cut a little too wide, to accommodate enlarged double cuffs. That cheap watch had far-reaching and long-lasting impact, one my wardrobe is only now, finally, shaking off. Shirt cuffs are now all considerably narrower, and the watches I wear with tailoring are slimmer and sleeker. So I recommend against designing a wardrobe around a watch. If you have no choice – because your watch is large, and you will not sell it or cannot buy a second, dress alternative – be aware of the dangers of enlarging cuffs too far. Realise the dangers and do so in moderation. Then reconcile yourself to a lifetime of checking the time, then pulling your cuffs back down again. You can follow the discussion on Shirt cuffs and watches by entering your email address in the box below. You will then receive an email every time a new comment is added. These will also contain a link to a page where you can stop the alerts, and remove all of your related data from the site. why not wear the said gargantuan watch over the cuff agnelli style .. to let the world know you are a style cognoscenti? I was going to write something about that, but left it out for space. or you could have said because I am an English gent who wants the individual to be remembered and not the way of wearing the watch. I don’t understand Agnelli, he had the money of Bill Gates and obviously enjoyed clothing but his style was as much hit and miss. I remember a newspaper article where admitted to wearing Armani jeans because they had the same initial as him! And I don’t think he was joking. I tend to wear my battered old GMT Master with everything ‘cept the old DJ and tails and while I probably wear it a little higher up the wrist than most I have never had a problem with either shirt or jacket cuff and I quite enjoy moving back a couple of inches of crisp cotton to tell the time. It feels sort of grown up – though I have to say I am considering a pocket watch – half hunter in gold. The difference in price between a Patek Phillipe wrist watch and pocket watch is amazing. Hi Simon. Your post got me thinking about the utility of the pocket watch. Do you find this sort of thing to be a function of age? I didn’t sport braces or a bowtie until I turned 40, and I think I’ll need to wait until I’m 50 to pull off a pocket watch. I have a Panerai that I wear with Turnbull and Asser shirts, which make up the majority of my shirt wardrobe. I sized my sleeves without the watch. I take it that the horrible, hated, big sports watch was not your GMT Master. Does the explanation in this post mean that you don’t wear your Rolex with dress shirts? Good post, I think it looks awful when guys wear a massive sports style watch with dress shirts/suit. Just because it is expensive doesn’t mean it looks good with a suit/dress shirt. A relatively cheap dress watch will always look better in this situation than a really expensive sports style watch. The point I was trying to make about considering a pocket watch related to obtaining a quality product at a remarkable price. I would love to own a Patek Phillipe watch – in particular a Calatrara but even second hand these would cost between £8k and £9k minimum. For reasons of fashion pocket watches do not command the same price as wrist watches which allows you to buy a sublime crafted product at half the price. A very decent Patek pocket watch can be purchased for £2k to £3k and I have my eye on an 18 caret gold half hunter with a hobnail design on the reverse which is on offer for £5K. As I am 50 I can probably pull off a pocket watch with a very slim chain. My only problem is I don’t wear waistcoats anymore and I think a chain, however slim, dangling down from the button hole looks terrible. So until I get back into waistcoats it will remain on the back burner but the premise remains; if you want a top quality watch and can only afford £1k to £2k buy a second hand pocket watch. Thanks John, I love it. trousers with belt loops – I never thought I would see the day on this blog you would mention suit trousers with belt loops! the other option of course (considering the sizes of men’s watches these days) is to find a good jeweller who would attach a strap to a pocket watch; while bulky this would probably pass as a medium sized watch in todays market. Only joking, but now I come to think about it……. Not a bad idea. The first wristwatches were exactly that, weren’t they? Pocket watches that had been converted with a strap. When I first had my Turnbull shirts made I never wore watches, and had the shirt cuffs made as tight as they can be. Eventually I started wearing slim dress watches (the JLC Reverso GT and the Rolex Explorer) which didn’t work with the super tight cuffs. The solution was to bring all my shirts back to Turnbull to have the left arm re-cuffed with a slightly bigger cuff. Works great, even though Turnbull initially insisted that we should re-cuff both arms as the left one would appear longer as the cuff was wider. I stood my ground however, and the shirts serve me very well. Both arms show same amount of cuff, while at the same time the left cuff now comfortably slips over the watch. In my experience, this is not true. I have more than 100 shirts made bespoke by a leading shirt maker in London (Budd). My usual watch is of regular size, not one of these horrible show off pieces. The cutter allowed ca 1,5cm plus for the left cuff from the beginning. It works perfectly on all my shirts. It may well be that the problems you describe have more to do with general poor fit and making. In the past 5 years, I have not heard many positive comments on the maker you are quoting, quite in contrary. I personally know several people who are dissatisfied with T & A, and who are looking for alternative makers. Thanks D. Good to hear the experience, though fundamentally a bigger shirt cuff is always going to slip further down the hand or lose that excess. Thank you for your immensely informative blog and the wealth of material in the archives. My question relates to cuff size. Leaving aside the complications of a large watch as discussed above, when wearing a button-cuff shirt, how tight should the cuff fit? Is a good rule of thumb to be able to comfortably fit two fingers between the cuff and your wrist (rather like with a collar) or is this too tight? Thanks, Simon. Helpful that the ‘two finger’ rule identifies one end of the spectrum! Purely out of curiosity, do the Neapolitans favour a different approach to the British, or is the general view that it is a matter of taste for the client? I’m looking for a little additional clarity on sizing shift cuffs. Above you give the helpful guide that there should be no less than 1 finger but no more than 2 fingers of room under the cuff. I’m wondering if this applies equally to both barrels cuffs and french cuffs? Looking at the picture of Mr. Gale at the top, it appears to me that he has more than that under his french cuff, particularly if we imagine his watch not being there. French cuffs often have more room, yes, though largely due to their shape – and wanting a clean line from the side of the wrist down to the point of the cuff. Still, many Italians in particular have them cut rather close – the same as a single cuff. Which can be less annoying when you are not wearing a jacket. In either case, the finger space provides a minimum. Simon, I notice a lot of Neopolitans do favor exceptionally tight cuffs for formal shirting while also favoring thicker (if not also wider) sports watches such as Rolexes. How does that work? It is contrary to what you say in this article. Am I correct in thinking that this is achieved by actually keeping the watch positioned at the lowest possible point on the wrist (toward the thumb joint) and outside the cuff? where is Turnbull & Asser made from ? It is, yes. They have their own factory there. Bespoke cutting might be done in London (Bury Street) but the making is also done in Gloucester. A quick question on French (Double) cuffs if I may? In your considerable opinion, other than with a suit, in what situations can a double cuff be worn instead of a barrel (single) cuff and do you have any thoughts on partnering it? For example, is a double cuff ever appropriate under a blazer, with knitwear (acknowledging the near-certainty for visible extra material/cuff-links at the cuffs), or without an additional top layer? Does the double cuff make a tie a necessity and the wearing with jeans out of the question? If further context helps, I am thinking of my white double cuff shirt from Emma Willis. The double cuff is basically more formal, so you’ve got to decide how formal everything else is you’re wearing. on the other hand if you just wear the double cuff shirt with everything Simon just mentioned not to it could become the next #menswear fad and you may be propelled to a stardom (of sorts) within the iGents community. I say just go for it … its all sprezz dude! aas you who are not afraid to say how they believe.